When you stay at Porto Hotel in Plunge, you'll be within a 10-minute drive of Plunge Park and St. John the Baptist Church. Featured amenities include a 24-hour front desk, multilingual staff, and luggage storage. Free self parking is available onsite. 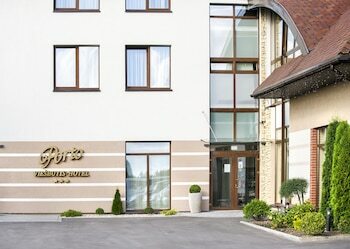 Located in Klaipeda, Tako Baras is by the sea and convenient to Zalgiris Stadium and Lithuanian Sea Museum. Free self parking is available onsite. With a stay at Gradiali Anykščiai in Anyksciai, you'll be within the vicinity of Beacon of Happiness Monument and Museum of Angels. Free self parking is available onsite.